This Freebie weekend is fun, isn't it? each pack has 10 hand cut flowers and 10 hand cut flower centres - I love hand cutting, die cut machines are very clever and have their place, but for me - I love to cut with scissors! There are also 20+ buttons - small ones and larger ones, in a mix of 2 hole and 4 hole designs, all dyed to match the felt perfectly... plus a polka dot and extra large button too. there's also a postcard in each pack with a photo of some flowers that I have stitched together - no instructions, but lots of ideas! If you would like to win one of my new craft Packs then please leave a comment and keep your fingers crossed! I can't have a freebie weekend without a felt prize can I? One person will win 10 felt packs (6"x6") one of each pack that I sell, and today there's no tricky guessing involved ... just leave a comment and the winner will be picked at random. I've been sorting out my button stock. All of the buttons I sell by weight are now stored in Sweetie Jars - and don't they look FAB? They are also very practical and super tidy - but did I also mention that they look FAB? The new storage also comes hand in hand with new prices - oh yes I have buttony bargains galore! This Jar is today's Freebie prize! Oh yes, I couldn't keep all this buttony-amazingness to myself now could I? ...because the person who guesses how much this Sweetie Jar and all the buttons weighs will win it! new packaging bags - the purpose? 'tis a freebie day secret! new storage - the purpose? 'tis a freebie day secret! oh no my friends - not a freebie day but a freebie holiday weekend!...it starts on Friday, but you'll need to come back on Saturday, Sunday AND Monday! Oh yes, freebies are back! Chevrons on grosgrain ribbon - I think it's ribbon heaven! Pom Pom trim is FAB - I must have it in my shop, and in my own sewing stash too. My original Teeny Tiny Pom Pom Trim comes from America - it's supplied to me on big spools and the colours are gorgeous, but I can't get enough of it! I just re-stocked and again didn't receive my whole order...it's not through lack of trying on anyones behalf - just that they sell out a lot because it's so popular. So I have hunted down another Teeny Tiny Pom Pom Trim supplier ... but the colours are completely different...what to do??? stock both, obviously!! The two trims are very similar ... the orange one up there is from America and the pale mint one is from the new selection, I think you'd be hard pushed to tell them apart!! My new trims are supplied on big cards rather than spools, which will help a lot when it comes to order picking!! I still haven't solved the 'getting hold of stock' problem - but at least with two different ranges I will always have some Teeny Tiny Pom Pom Trim in the shop! All my pom pom trim can be seen here, and if you're quick my larger pom pom trim has been popped into the sale because I can't get it at all anymore! This little bunny has been made from my newest mini kit - and the kits are now my shop - just in time for some Easter crafting! Eagle-eyed shoppers will have seen Bunny in John Lewis for the past month or so, but the crazy busy-ness over the past few weeks saw me drop the ball on this one! ...which is a very colourful section indeed! step three :: spend hours & hours making the trays look pretty and filling them up and revelling in the colourful button-y fun pack orders at warp speed tomorrow so I get a free hour or three to get all the buttons in the trays, photographed & on the website!! **Setting up as a Limited Company is BORING - I have done most of it, just waiting for the tax man to send me stuff so I can register for Tax & Vat & employer stuff (I am already registered as a sole trader but you have to do it all again for a Ltd company) oh, and I have to go and open a new Business Bank Account too . . . . doing all the tax/vat/bank stuff once was boring enough, but doing it twice! *sigh* doesn't the tax man know I need to do more sewing??? **the 1st freebie of the year is being planned - I have missed Jan, Feb & March so APRIL'S FREEBIE will be a good one!! ooohhh so many lovely ribbons :: they arrived yesterday all the way from America - I only ordered last Sunday so their turnaround is pretty spectacular! I was running very low on lots of my favourites so I did a big order - but 771 spools don't take up much table space do they? Today I have boxed up the last wholesale order from the Trade Show - it's a nice feeling to have all the orders complete and winging their way around the UK and foreign shores. Next on my list? 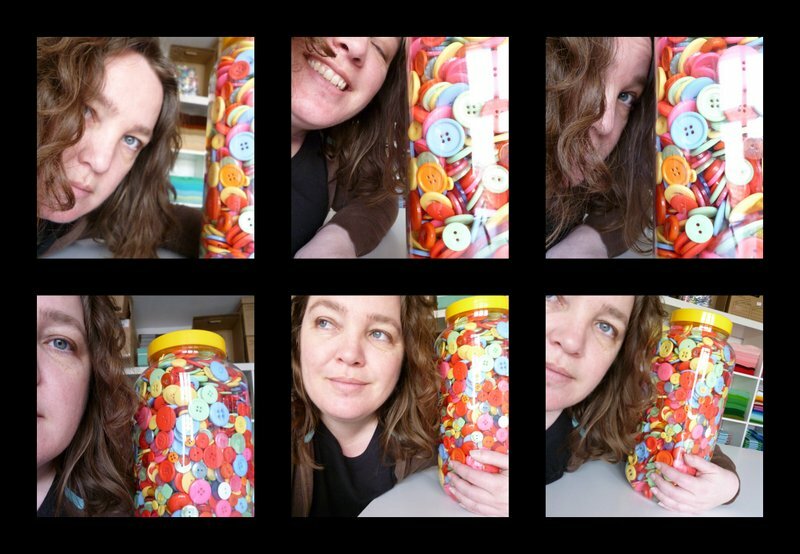 an hour or two with my new button catalogue!! well, I can't work hard all the time can I? sometimes it's good to have a plan. other times it's good to think on your feet. some of my new buttons have arrived - but not all - so my plan is still being formulated....later on is still later on, but only just....storage has been ordered (yesterday) and the button selling plan is taking shape in my mind at least....it may take a little while longer to translate it on to the website! ...and today it's super cute tiny ric rac!